AppSense, which specializes in what it calls ‘user virtualization’ solutions, has raised $70 million in its very first round of funding. Interestingly, the entire investment comes from one backer, Goldman Sachs, whose managing director Pete Perrone will be joining the company’s board of directors. AppSense says it will use the funds to “capitalize on its position as a market leader” in what it anticipates will turn out to become a $2 billion market in the next few years. More information about the investment is available on AppSense’s blog. 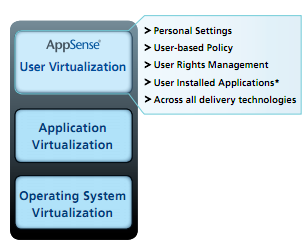 User virtualization is a way of managing all user-specific information (think: user-based corporate policy, personalized settings, user rights management and user-introduced applications) independent of the desktop, and applying this information on-demand into any desktop. This essentially enables IT departments to standardize the corporate desktop build, automate desktop delivery and easily and securely migrate users to new desktops. AppSense has been providing technology solutions to simplify desktop management for over twelve years now. In 2010, AppSense signed up more than 4,000 enterprise and government customers around the world, including major companies like BT, ESPN, JPMorgan Chase and United Airlines. Last year, AppSense says it sold some 1.5 million user licenses, comprising a partnership with Fujitsu to provide desktop management solutions to the Department for Work and Pensions for more than 1,000 locations and over 140,000 users in the UK. The firm says it is profitable and growing, booking a turnover of $47 million in 2010, a 60 percent increase on the previous year. Charles Sharland, chairman and co-founder of AppSense, and the company’s recently appointed CEO Darron Antill together used to lead Vistorm, which was acquired by EDS back in 2008 and now makes up – essentially – HP’s entire Information Security business.